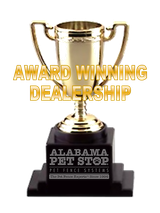 Please fill out the form below to request service for your pet containment system. To expedite your request, please include any additional pertinent information in the Details & Comments section, along with the best times to contact you so we can confirm your request via telephone. Our office will call you the same or next business day to arrange service. All brand names are the registered trademarks of their respective owners. The Invisible Fence Logo®, Invisible Fence®, Invisible Fencing®, PetSafe®, Radio Fence®, Instant Fence®, Safe Dog®, Powercap®, Invisible Gate®, Shields®, Petsafe Pro®, ProLite™, Pro280™, MicroLite™, R21®, R51®, R22®, and Computer Collar® are registered trademarks of Radio Systems Corporation. Dog Guard® is a registered trademark of Sunward Electronics, Inc. DogWatch®, SafeLink™, and Pet Friendly™ are registered trademarks of DogWatch, Inc. Lazy Dog Calming EO Mist™ and Quit Buggin' Me EO Flea & Tick Spray™ are registered trademarks of Leaf of Life Botanicals. doTERRA®, On Guard®, TerraShield® and CPTG™ are registered trademarks of doTERRA. 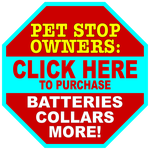 PET STOP®, Safer By Design™, Comfort Contacts™, Gentle Steps™, SmartReceiver®, ComputerReceiver®, UltraElite®, UltraMax®, UltraTuff®, EcoLite®, Ultra Comfort Contact®, OT-100®, OT-200®, OT-300®, PCC-200™, Edge-To-Edge™, Universal Remote Trainer®, VVL®, Wire-Free™, PetLink™, and SmartStation™, are registered trademarks of Perimeter Technologies, Inc. Pet Fence Pros™, PetStuffWarehouse.com™, Pet Stuff Warehouse™, WiFiWirelessDogFence.com™, AlabamaPetDoors.com™, Pet Door Experts™, AlabamaDogDoors.com™, and Pet Fence Experts™ are registered trademarks of McDonald Brothers, Inc.
© 2015 McDonald Brothers, Inc.